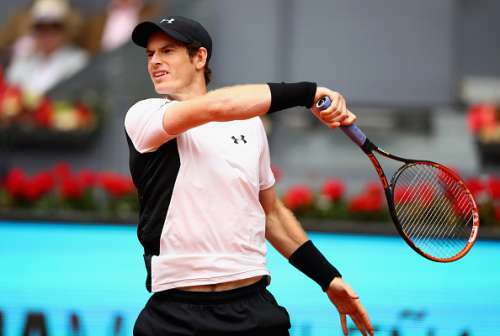 Defending champion Andy Murray cruised into the quarter-finals of the Madrid Open tennis tournament on Thursday with a 6-4, 6-2 victory over Gilles Simon. The second seed battled past Radek Stepanek in his opening second round match on Tuesday evening and dominated against Simon, wrapping up victory over the Frenchman in one hour and 39 minutes. Murray claimed his 14th win in 16 meetings with Simon as he set up a quarter-final clash with either Tomas Berdych or David Ferrer. "I didn't return that well at the beginning," Murray said in an on-court television interview after the match. "But when I got into a rhythm, I was able to dictate a lot of points. I used my variety well and served well. He wasn't able to put me under much pressure on my serve after the first couple of games." "It's obviously very tricky against Simon. He lulls you into a false sense of security in points. Sometimes the better you hit the ball, the better it comes back. It's tough to get the balance between being aggressive and being patient." The 28-year-old Murray won his first World Tour Masters 1000 tournament on clay last year when he defeated Spanish star Rafael Nadal in the final in Madrid.